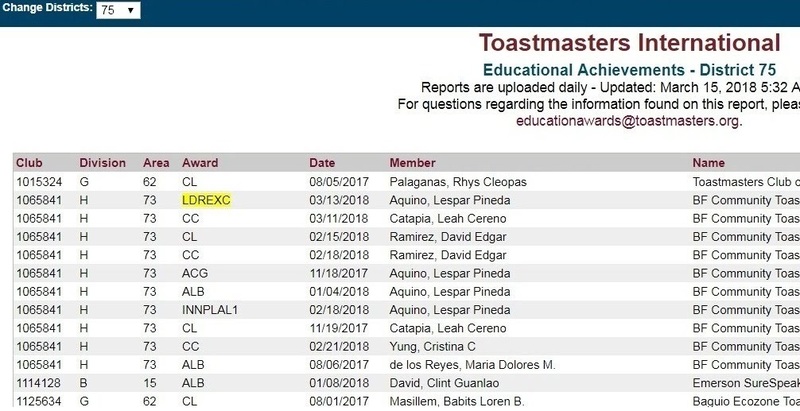 Toastmasters Speeches: Leadership Excellence (LDREXC) Award Processed! Wow. I didn't realized I'd see the LDREXC award posted in the TI website this quick. The LDREXC application for my HPL project for the PCJ-COY (Presentation of the Child Jesus parish, Commission on Youth) was submitted by VPEd Krissie just last Tuesday. Anyway, one requirement down for my Advanced Leader Silver (ALS) goal!